First-ever chapters on Virtual/Augmented Reality and eSports. Updated user data in every chapter. Suggestions on how to get a job working with the technologies discussed. The companion website, www.tfi.com/ctu, offers updated information on the technologies covered in this text, as well as links to other resources. The Communication Technology Ecosystem, August E. Grant, Ph.D.
A History of Communication Technology, Yicheng Zhu, M.A. 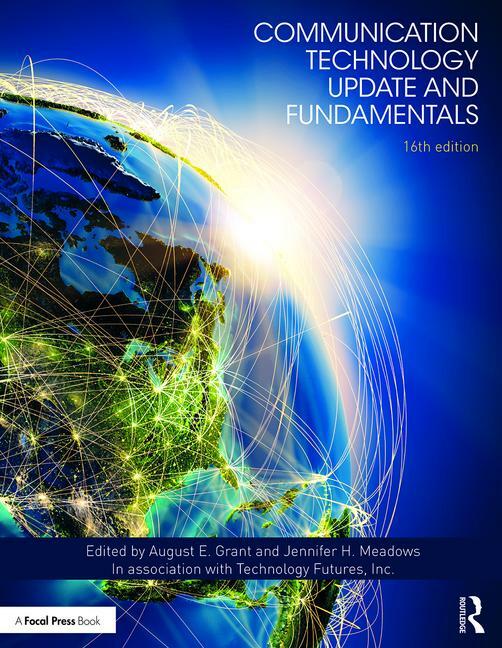 Understanding Communication Technologies, Jennifer H. Meadows, Ph.D. The Structure of the Communication Industries, August E. Grant, Ph.D.
Communication Policy & Technology, Lon Berquist, M.A. Digital Television & Video, Peter B. Seel, Ph.D.
Multichannel Television Services, Paul Driscoll, Ph.D. & Michel Dupagne, Ph.D.
Radio & Digital Audio, Heidi D. Blossom, Ph.D.
Digital Signage, Jennifer H. Meadows, Ph.D.
Cinema Technologies, Michael R. Ogden, Ph.D.
Internet of Things (IoT), Jeffrey S. Wilkinson, Ph.D. Automotive Telematics, Denise Belafonte‐Young, M.F.A. Video Games, Isaac D. Pletcher, M.F.A. Virtual & Augmented Reality, Rebecca Ormond, M.F.A. Home Video, Matthew J. Haught, Ph.D.
Digital Imaging & Photography, Michael Scott Sheerin, M.S. eHealth, Heidi D. Blossom, Ph.D. & Alex Neal, M.A. Esports, Jennifer H. Meadows, Ph.D. & Max Grubb, Ph.D.
Broadband & Home Networks, John J. Lombardi, Ph.D.
Telephony, William R. Davie, Ph.D. The Internet, Stephanie Bor, Ph.D. & Leila Chelbi, M.M.C. Social Media, Rachel A. Stuart, M.A. Big Data, Tony R. DeMars, Ph.D.
Other New Technologies, Jennifer H. Meadows, Ph.D. Your Future & Communication Technologies, August E. Grant, Ph.D.
Dr. August E. ("Augie") Grant is J. Rion McKissick Professor of Journalism and Director of the Center for Teaching Excellence at the University of South Carolina. Grant is a technology futurist who specializes in research on new media technologies and consumer behavior. His teaching and research combine the study of traditional and emerging media, with emphases on media management, organizational structure, integrated communication and consumer behavior. He’s been editor of Communication Technology Update and Fundamentals since 1992. His work in media convergence includes founding and serving for five years as Executive Editor of The Convergence Newsletter, chairing twelve national conferences on convergent journalism since 2002, and directing the Newsplex Summer Seminar program to train academics in convergent journalism. Jennifer H. Meadows is Professor and Chair of the Department of Media Arts, Design, and Technology at California State University, Chico. Her teaching and research integrate practical and theoretical concerns related to television production, virtual reality, digital signage, the relationships between media and users, and changing media behavior in the new media marketplace. She has been working on the Communication Technology Update and Fundamentals since 1995 and has been co-editor since 1998. Technology Futures, Inc. (TFI) provides top-quality custom studies and technology forecasts on key trends in communications, artificial intelligence, virtual reality, and other high-tech fields. Founded in 1978, TFI’s specialties include technology forecasting, valuation, innovation, and business leadership. TFI brings to the table a futures focus, in-depth experience, a wide range of proven forecasting and analytic methods, and an excellent track-record of making valuable forecasts over several decades. www.tfi.com.